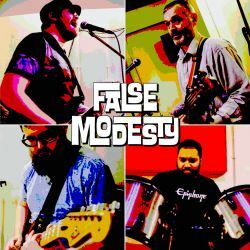 False Modesty are a British Indie - Brit Rock originals band from the Midlands. A more rag-tag bunch of misfits you may never find; having all individually played in bands from a young age, they came together in 2014 and have since been getting progressively less attractive. They’re all a little bit awkward and unquestionably unfashionable. They play bloody good music though! Drawing inspiration from the annals of rock music from the 60s to the present, they note their idols to be the likes of ACDC, Metallica, The Rolling Stones, The Stereophonics, Pearl Jam, Led Zepplin, Foo Fighers, Nirvana, Oasis etc. With quite an eclectic range of tastes and styles they blend grunge, blues and rock into their music with grooving bass lines, hard hitting guitar solos and rhythmic melodies.